Seville is a smart, elegant city and its locals have a reputation throughout Spain as being pijo—posh—and fussily dressed. This doesn’t mean the city lacks some superb flea markets and thrift stores though. Here are the best places to head for a bargain in the Andalusian capital. 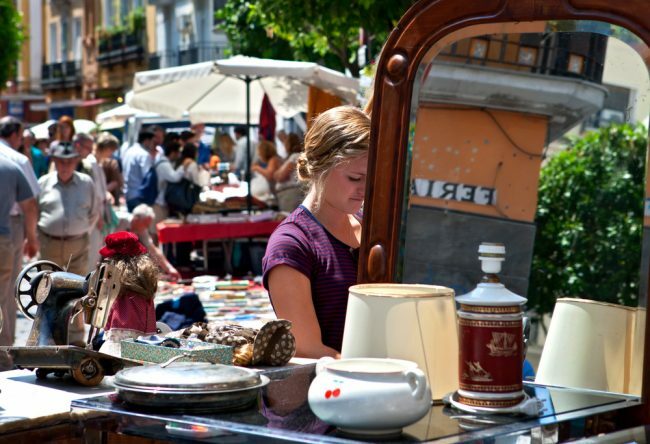 Every Thursday, Calle Feria comes alive with Seville’s largest, oldest, and most colorful flea market. This hoarder’s paradise has been a staple of the city’s street life for as far back as locals can remember and is a great place to spend a Thursday morning (jueves in Spanish, hence the market’s name), even if you don’t end up buying anything. To describe just a small proportion of Jueves’ wonderfully random offerings—you can buy antiques, flamenco dresses, books, ornaments, paintings, toys, sculptures, plants, sewing machines, old barbers’ chairs, birdcages, and more. In fact, you can buy pretty much anything here. Towards the northern end of Calle Feria is also Seville’s oldest food market, the Mercado de Feria. If you’re on Calle Feria to root around the Thursday flea market, you’re also well-placed to check out Seville’s best thrift clothing stores. At number 37 is Ropero—not a shop you’re likely to miss. Its colorful window display is always crammed full of goodies and is flanked by spray-paint murals of a giant squid. Inside, giant squids are one of the few things not on sale, with a huge range of used clothes, accessories, and trinkets on offer. The shop specializes in vintage clothing, but sells a good mixture of styles as well as brand new attire at unbelievably low prices. Ropero’s cheerful and helpful owner, herself a walking advertisement for the vintage style, is only too glad to help you out if you need advice or have questions before you buy. Adding to the colorful line-up of thrifty clothes and accessory outlets on Calle Feria is Jueves Sevilla Vintage, situated right next door to Ropero. Another bright and cheerful window display entices you inside, where you’ll find all manner of new and secondhand clothing and accessories as well as completely useless items that you simply have to have. Like Ropero, Jueves—which takes its name from the flea market that transforms Calle Feria into a kind of souk every Thursday morning—specializes in vintage and retro-style clothing, although one of the pleasures of browsing here is that that you’ll always find something surprising, too. Prices are impressively low and service is friendly and helpful, making it one of the best places to clothes shop on a budget in the Andalusian capital. 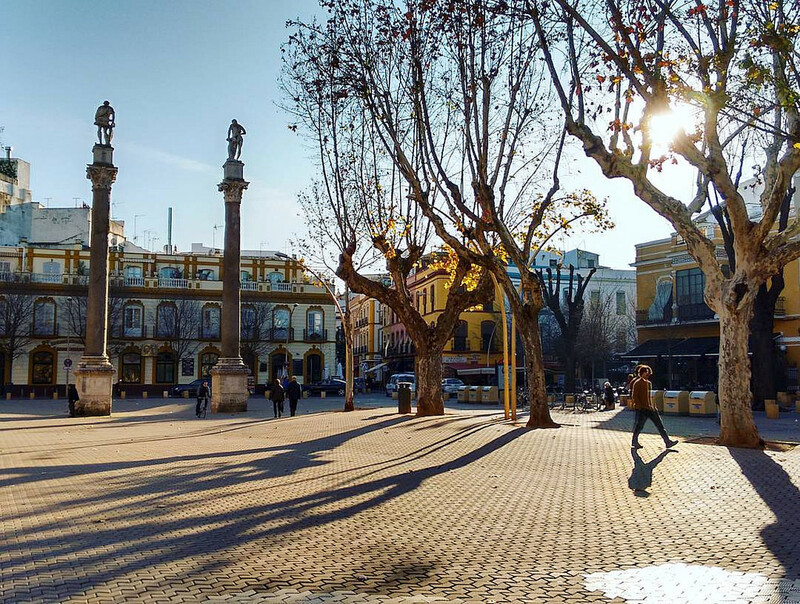 Every Sunday morning at 7:30 a.m.—when the last of Saturday’s revellers are thinking of calling it a night—the super-trendy Alameda de Hercules hosts one of the Andalusian capital’s most interesting arts and crafts markets. In addition to paintings and sculptures by local up-and-coming artists, the Alameda market also offers a huge range of trinkets, antiques and assorted nick-knacks that may be complete junk to some and the find of the year for others. But whether you’re buying or just browsing, the Alameda itself is a lovely place to pass a Sunday morning and offers the weary bargain-hunter every conceivable type of refreshment. And there is always the possibility that you could pick up an original work of art that in a few years’ time could be worth a small fortune. After opening a new store on Calle Marques de Pickman in June 2016, Humana now has three thrift clothing shops in the Andalusian capital (as well as stores in Madrid, Barcelona, and Granada). The original outlet on Calle Feria is now closed, and although the new flagship store on Pickman is about a ten-minute walk from the city center, it’s well worth a visit if you’re shopping on a budget. 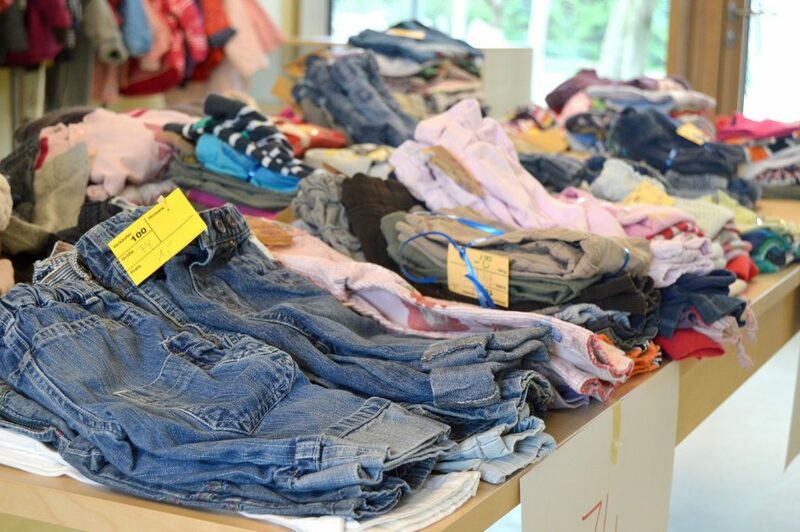 Humana’s range of secondhand clothes are often hardly worn and from top-end labels, and although prices tend to be a little higher than at Ropero and Jueves, you’ll still come away with an absolute bargain. Hiding on an unassuming back street a couple of minutes away from the popular Alameda de Hércules square is La Pequeña Boutique, a small but excellent secondhand clothing store. A women’s clothing specialist, it offers a good range of garments and shoes at prices that can sometimes make Ropero ad Humana look pricey. Not a place where you’re likely to bump into any pijo Sevillanos, but all the more charming for it.